The West End revival of Company, which stars Rosalie Craig and Patti LuPone, has been confirmed to begin its cast recording at the weekend. The recording sessions will also be filmed for an upcoming 2019 documentary on the making of the Marianne Elliott production, which offers an innovative new take on the Stephen Sondheim classic. Company is now booking at the Gielgud Theatre until 30 March 2019. Bobbie (Rosalie Craig) can’t seem to catch a break from all those pestering questions in Company. The Company cast recording will feature the voices from the current London revival, a production that has been noted for gender-bending its lead character from the original male Bobby into the female Bobbie. It is speculated that Stephen Sondheim will supervise the recording sessions as part of the new documentary. The official release date for the new cast album will be announced in due course. 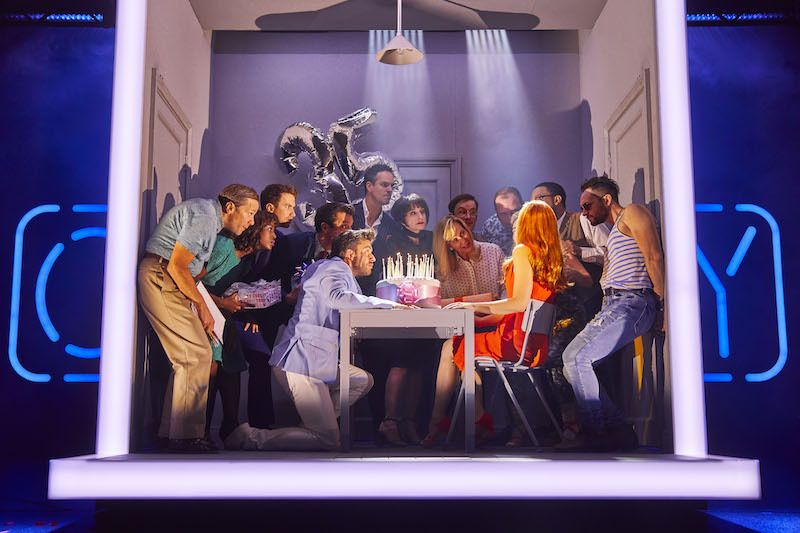 The West End Company cast stars Rosalie Craig as Bobbie alongside Patti LuPone as Joanne, Alex Gaumond as Paul, Ashley Campbell as Peter, Ben Lewis as Larry, Daisy Maywood as Susan, Gavin Spokes as Harry, George Blagden as PJ, Jennifer Saayeng as Jenny, Jonathan Bailey as Jamie (originally written as Amy), Matthew Seadon-Young as Theo, Mel Giedroyc as Sarah, Richard Fleeshman as Andy, and Richard Henders as David. The cast is completed by Ewan Gillies, Francesca Ellis, Grant Neal, Jaimie Pruden and Michael Colbourne. Rosalie Craig recently won Best Musical Performance for her portrayal of Bobbie at the 2018 London Evening Standard Awards while Marianne Elliott won for Best Director. Bobbie is 35 and still single, but her friends and family seem to be more worried about that than she does. At her birthday party, will the interrogations ever stop? ‘How long have you been single?’ ‘Have you found a man yet?’ ‘When will you settle down and have children?’ Company is a charming musical featuring such toe-tapping numbers as ‘You Could Drive a Person Crazy’, ‘Getting Married Today’ and ‘Being Alive’ that will have you dancing in your seat! And now you can look forward to a cast recording coming soon! Purchase your West End Company tickets. *Company tickets are now on sale with no booking fee as part of our Black Friday deals. The offer ends on the 26th of November!